I must make a confession. I had few friends until my second year at university. I was quiet, shy and completely worldly unwise. I only spoke when spoken to in class, handed my homework in on time every time. Class A swot. But life changed a little when I moved away from home. The catalyst was food – or rather cooking it! My second year at university was in Cologne, Germany. I lived in a beautiful new build, Norwegian, timber framed kit house. Rooms were allocated alphabetically and nationalities were mixed up so I was sharing with two German girls and an English girl from my class. I was terrified. I had never lived away from home before. Never shared a fridge or cupboards or anything other than with my sisters and then I had first dibs because I was the eldest. The first thing I did was go shopping. For cooking utensils, plates, bowls, glasses and staple store cupboard food. I had brought my spices from home. Then I cooked. For me, for my housemates, for the girls downstairs, for the Norwegian builders, for the Moroccan lads in the block opposite who never let me walk home at night on my own, for Marlon who taught me to DJ….and so on. When I cooked, I made new friends. This continued in my third year in Aix-en-Provence in France but here I shared a kitchen in a dormitory with about 20 other students of all nationalities so I learned to cook too. Angela from somewhere near Naples taught me the basics of pasta sauces, Steffi from Germany imparted her knowledge of how to make ‘Volkorn’ bread, Marie-Noelle from Mauritius showed me her mother’s prawn curry. I was really lucky that I knew the basics and could pick things up quickly. My mum had literally hammered them into me before I left. Perhaps not the most inspiring way to learn but indispensable nonetheless. University developed these and new friendships at the same time. Nowadays there are courses and cookbooks but with costs that are completely unrealistic for a student on a grant or weekly allowance, who are the actually targeted at? 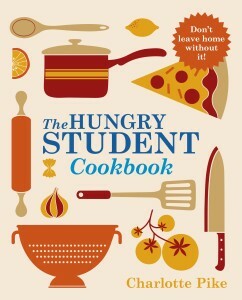 This is the first thing I noticed about The Hungry Student Cookbook range. It’s affordable. £7.99. That’s a proper student price! The introduction sets out 34 pieces of kit. I had flashes forward of making up a box for Amber when she sets off to fashion college in oh…7 years time! Then there are 36 ingredients for a student store cupboard which are again realistic and likely to appeal to a student who knows it all. But my favourite part was how not to poison your friends – practical and easy tips on hygiene and defrosting. The first section is pasta which I had never actually eaten until I got to university. I grew up on curry, rice and chappattis so this chapter with recipes for Tomato and Garlic Spaghetti, Mac and Cheese and Creamy Pesto Pasta would have been a new world to me. I tested the book on 10 year old Amber and she found it easy and un-scary to follow. Next up a few stir fry and noodle staples with tips on making more and freezing for those munchies you get at 3am after clubbing (which of course I never did). 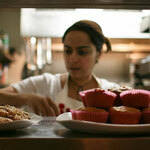 Soups, stews and curries next which draws on international recipes that can be easily adapted. Other staples for me were jacket potatoes and toast. Effortless and fast. This books gives many ideas for different toppings – creamy mushrooms, houmous and roasted peppers, pesto vegetables and many more. Finally the book moves on to recipes which I think a novice student would find challenging but interesting and reminiscent of home – baked fish, fishcakes, risotto, pies, puddings and cheesecakes. 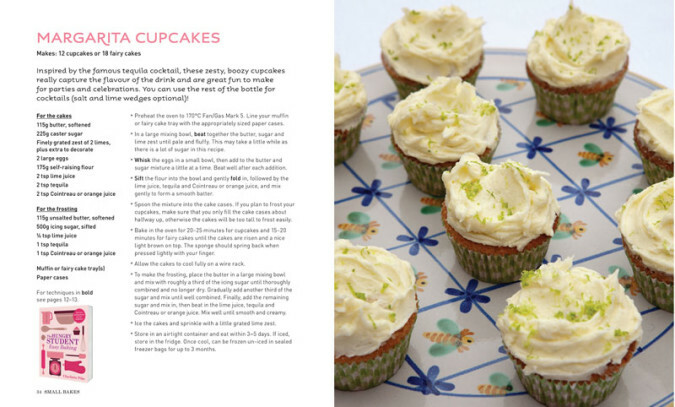 What makes me smile with this book is the ‘studenty’ recipes – red wine cake, vodka pasta, margarita cupcakes. There is always alcohol in a student house and as criminal as it may seem to many of my uni friends reading this, it’s not a bad thing to use in food vs neat shots of downing glasses. There are three books in the series. The other two are equally good but there is some repetition of sauces and basics in the intros. Amber is making a head start on the baking book which is very timely with The Great British Bake Off back on our screens and a few students in the contestant line up. Which dishes did you cook at university? Are there any you still make today? What was your alcohol recipe of choice? Many thanks for linking to my post – I love these books too as you know, can’t recommend them enough! My kids grew out of the making fairy cakes with mum stage, and lost interest in cooking for a while. But they both now have their favourite cookbooks and are wanting to make meals for us. 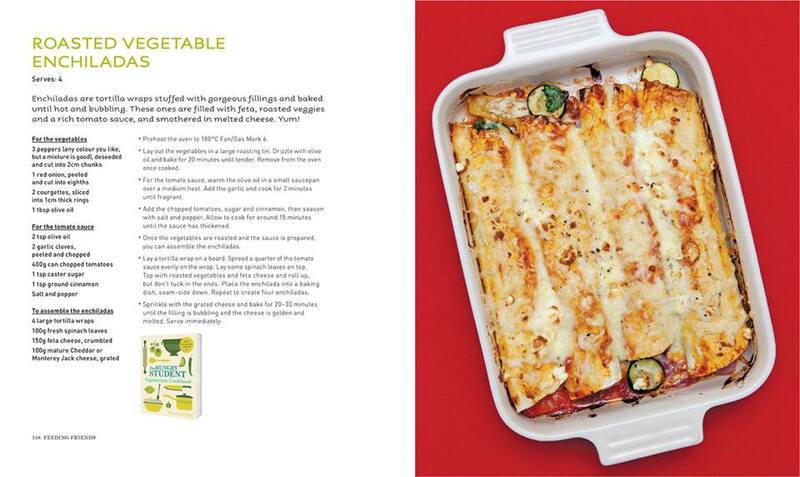 I might have to sneak a copy of the vegetarian book onto the kitchen shelf and see who offers to cook from it first… might just need a bookmark in the vegetable enchiladas page too, they look very good! Amber chose Gnocchi with Tomato Sauce and what I was most impressed with was that she adapted the recipe before starting to remove the cheese – apparently she doesn’t like bit cheesey! I love your story – your student days sound so interesting. I can remember tinned mince featuring heavily in mine – narrow escape from BSE I think! I was lucky to study languages. There was always a mad mix of people around. I think tinned mince was up there for many of my English friends too. On toast, on pasta, on mash! I have loved these books and also to hear your student adventures is so interesting. It does sound like you really got into it after a quiet start. Bet you made up for it later! I will be letting my children loose on these books over and above many others. They ate their first curry from the recipe in this book, a big achievement that I will be continuing! Thank you lovely. And well done again for a fab book. Now we just need to see you on the telly!